A course deviation indicator (CDI) is an avionics instrument used in aircraft navigation to determine an aircraft's lateral position in relation to a course. 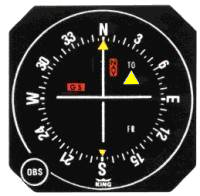 If the location of the aircraft is to the left of course, the needle deflects to the right, and vice versa. The indicator shows the direction to steer to correct for course deviations. Correction is made until the vertical needle centres, meaning the aircraft has intercepted the given courseline. The pilot then steers to stay on that line. Only the receiver's current position determines the reading: the aircraft's heading, orientation, and track are not indicated. When used with a GPS, or other RNAV equipment, it shows actual distance left or right of the programmed courseline. Sensitivity is usually programmable or automatically switched, but 5 nautical miles (9.3 km) deviation at full scale is typical for en route operations. Approach and terminal operations have a higher sensitivity up to frequently 0.3 nautical miles (0.56 km) at full scale. In this mode, the OBS knob may or may not have an effect, depending on configuration. When used for instrument approaches using a LDA or ILS the OBS knob has no function because the courseline is usually the runway heading, and is determined by the ground transmitter. A CDI might incorporate a horizontal needle to provide vertical guidance when used with a precision ILS approach where the glideslope is broadcast by another transmitter located on the ground. A CDI is not used with an automatic direction finder (ADF), which receives information from a normal AM radio station or an NDB. The CDI was designed to interpret a signal from a VOR, LDA, or ILS receiver. These receivers output a signal composed of two AC voltages. When used with a VOR, a converter decodes this signal, and, by determining the desired heading or radial from a resolver connected to the OBS knob, provides a 150mV control signal to drive the CDI needle left or right. Most older units and some newer ones integrate a converter with the CDI. CDI units with an internal converter are not compatible with GPS units. More modern units are driven by a converter that is standalone or integrated with the radio. The resolver position is sent to the converter which outputs the control signal to drive the CDI. For digital units, the desired position of the needle is transmitted via a serial ARINC 429 signal from the radio or GPS unit, allowing the CDI design to be independent of the receiver and by multiple receiver types. ^ FAA (2016). "16. Navigation". Pilot's Handbook of Aeronautical Knowledge (PDF). p. 23. The CDI is found in most training aircraft. It consists of an omnibearing selector (OBS) sometimes referred to as the course selector, a CDI needle (left-right needle), and a TO/ FROM indicator. ^ Radio Navigation & Instrument Flying. Air Pilot Publishing Ltd. 2008. ISBN 1-84336-069-1. ^ "400 Series Installation Manual" (PDF). p. 5.10. This page was last edited on 28 August 2018, at 22:23 (UTC).